Is Alexander Payne mocking his characters? That question often lingers in viewers' minds after watching a Payne film, and it will surely will arise following his latest, "Nebraska." The movie focuses on the pathetic, quixotic quest of Woody Grant, a senile and alcohol-addled Korean War veteran. Woody is not only foolish enough to believe he's won a million dollars from one of those sweepstakes letters that the rest of us customarily toss in the trash, he's also insistent on collecting his winnings personally by making the 900-mile trek from his home in Billings, Montana, to the prize office in Lincoln, Nebraska. By himself. On foot. The first time we see him, he's shuffling determinedly along a busy highway. Even at this early point, Bruce Dern conveys a great deal about Woody just through his presence, his carriage, his gait. Dern makes Woody as cantankerous as he is clueless, bobbing and weaving to avoid his inevitable mortality, but there's a purity about him that'll break your heart. Following a career marked by psychos and wild cards, this watery-eyed senior citizen inspires the 77-year-old star to give the performance of a lifetime. Payne regards Woody and the folksy folks he meets with some affectionate teasing, but also with the no-nonsense clarity of a fellow Midwesterner. The interiors of the characters' middle-class homes are cluttered with schlocky knick-knacks. Their clothes are utilitarian and unfashionable. They are complacent at best and scheming at worst. You could interpret all this as mockery, but also as a vivid perception of a region that shaped Payne and gave him his bite. Woody's son, David (former "Saturday Night Live" player Will Forte), seems like one of the good guys. A single and struggling electronics salesman, he trudges along in work and in life. He and his father aren't terribly close because Woody isn't terribly close to anyone; family is the expected phenomenon that just sort of formed around him at some point. But when Woody keeps pressing to pick up his prize money, David sees an opportunity to spend some time together, and maybe even enjoy some long-overdue father-son bonding. So they hop in David's car, to the frustration and disgust of Woody's loyal and long-suffering wife, Kate, played by scene-stealer June Squibb. Don't let this woman's diminutive size and frumpy wardrobe fool you: she is a formidable force, a foulmouthed voice of reason. Along the way, Woody and David stop to see Mount Rushmore (dad is unimpressed) before making an extended visit to Woody's hometown in Nebraska. The son becomes increasingly frazzled by his inability to keep his father out of his dive-bar haunts and stop him from spouting off about his alleged windfall. Forte makes you feel the sense of resignation growing beneath David's sad eyes and placid exterior. It's an inspired bit of casting. In no time, Woody becomes a local celebrity for better and for worse. Old acquaintances and relatives alike regard him with an uneasy mix of pride, envy and greed; the most predatory is a subtly creepy Stacy Keach as an old friend who claims Woody has owed him money for decades. A couple of oversized, oafish cousins make their intentions known in far less subtle fashion. But this is no wacky family romp, nor is it a tearful reunion. If that weren't already clear to us, Payne offers the abrupt image of several of Woody's relatives gathered around a television to watch a football game: old men in bland, buttoned-down shirts, all facing the same direction, barely grunting small talk at each other. The film receives a jolt of energy and a vulgar bit of heart when David's mother Kate and brother Ross (Bob Odenkirk)—a pseudo-slick aspiring news anchor—show up to try to to rescue Woody. This is a rare film that Payne directed but didn't help write—the script comes from Bob Nelson—but it nevertheless allows the filmmaker to return to his home state, which was also the setting for the high school satire "Election" and the road movie "About Schmidt." The sense of place is unshakable. "Nebraska" is shot in bleak black-and-white by Payne's frequent cinematographer Phedon Papamichael ("Sideways," "The Descendants"). It's a choice that highlights the story's prevailing sense of melancholy and decay rather than trying to impose a cloying nostalgia. 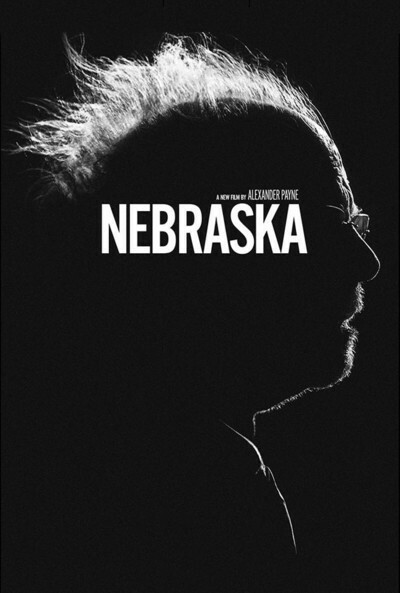 "Nebraska" is full of complicated people marked by flaws and failures, mistakes and regrets; they can be selfish bastards, too. It often feels as though Payne is trying to strip away the cliché that the region is populated exclusively by hardworking, decent hearted types, But for all the cragginess Woody exudes with his etched face and mess of white hair, he has also inspired a great deal of love in this director. The film's starkly beautiful final images have a poignancy that might leave a lump in your throat.